The best in commercial and residential surfaces in the industry. PlayN Wisconsin offers state-of-the-art all-weather performance outdoor and indoor courts by Flex Court, that bring athletes of every skill level together – from the casual to the serious professional. 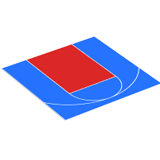 We have surface options to meet every playing condition. 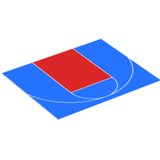 Keeping you, your family, and all athletes who play on our court surface safe, is our number one priority. Our all-weather outdoor sports tiles provide a cushioned, fast dry surface that incorporates the latest in strong, lightweight composite materials. They are specifically designed and proven to absorb shock better than any traditional athletic surface, which can help protect against serious stress-related injuries. Our courts provide an environment that’s exciting for athletes young and old. Our high-performance athletic floors keep you safe when you play on our courts, giving you peace of mind. 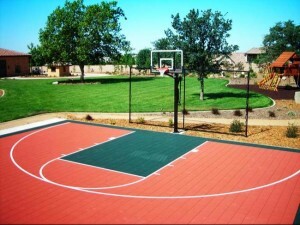 Looking for an outdoor court that can provide your family endless hours of fun? Your search ends here! 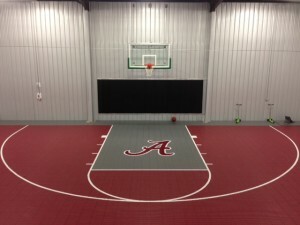 Whether it’s bashing backhands for tennis, slamming dunks in basketball or having a place for general exercise and fitness, Flex Court Multi-Game courts can be custom made for your specific needs! Our fast drying, quick draining, all-weather surfaces are built with comfort in mind. 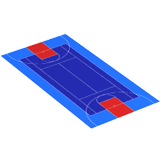 They radiate 50% less heat than a traditional multi-game court and boast our FleXion and TraXion grip systems, which reduce wear and tear on your body. Plus they come in a variety of colors, and layouts. 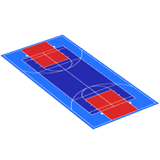 Custom build your Flex Court Multi Game Court to fit your needs! 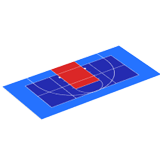 Which Sports Can I Play On A Multi-Game Court? All sports listed above are available in stand-alone layouts as well. 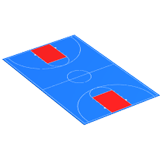 Check out our Court Layouts to see what kind of combinations we have available. 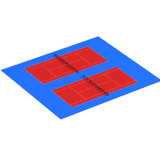 Keep in mind, we make all of our Multi Game courts to order so if you don’t see a layout you want, then ask our sales staff! 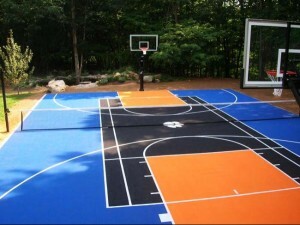 The basketball court of your dreams is just a few clicks away. 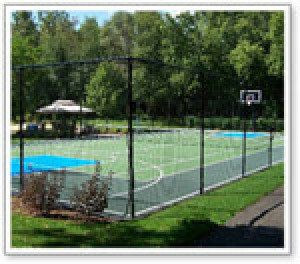 Flex Court outdoor basketball courts are a perfect fit for your backyard and ideal for training facilities and recreation centers. 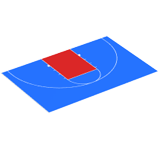 Wherever your game is, Flex Court has you covered. 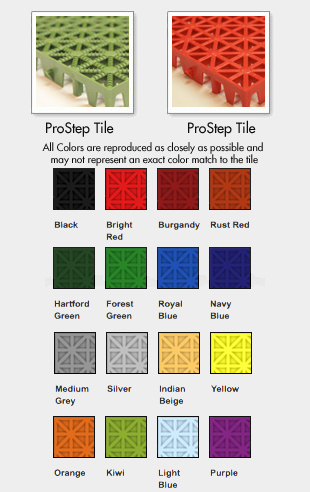 Our Pro Step tiles were initially invented and patented based on an orthopedic concept designed to reduce lateral and vertical stresses. With specific modifications that have improved both FleXion and TraXion, our basketball courts are incredible shock absorbers that will help reduce wear and tear on your joints, meaning more time to shine and play the game you love. 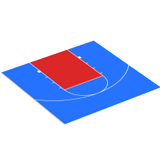 Why Should I Choose a Flex Court Basketball Court Over Other Surfaces? 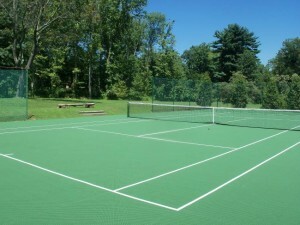 Our tennis court surfaces are suited for a very wide range of tennis enthusiasts. Our surfaces follow ITF and USTA ratings as a Pervious, Cushioned and Fast Dry Surface with a Category 5 Fast pace high performance surface for both recreational and professional tennis players. Furthermore, Flex Court Tennis Courts are an all-weather surface that drain quickly to prevent the accumulation of standing water and hazardous puddles. Our outdoor tennis courts practically maintain themselves, so nothing will be standing between you and slamming serves every day. The quick draining systems make cleaning a simple job for the hose or power washer. We are proud to service a wide range of tennis training facilities, recreation centers, resorts and even hotels, such as the Marriott and Hilton. Our courts are ideal for outdoors, but are also perfect for indoor use under a roof or dome. 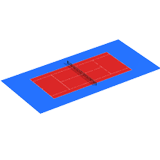 Whether you’re working on your volley or blasting backhands, a Flex Court Tennis Court is the better choice for your home or commercial property. 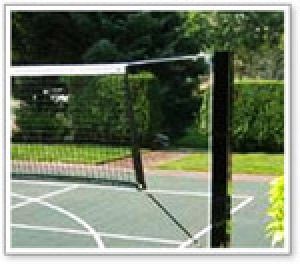 Your search for the perfect tennis court ends here. Flex Court Tennis Courts were engineered with the help of orthopedic surgeons to ensure that they had the best grip ratio in their class. With use of our FleXion and TraXion technologies, the ¾ in (75mm), shock absorbing, suspended surfaces offer exceptional feel and tremendous performance that will help alleviate lower back, knee and ankle pain. 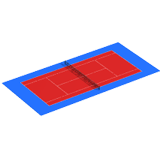 In fact, Flex Court Tennis Court surfaces are recommended over traditional, unforgiving surfaces for their built-in lateral and vertical forgiveness. Are Flex Court Tennis Courts Right For Me? Tougher than carpet, and softer for the kids than falling on concrete, GYM FLEX™ multi-purpose flooring incorporates the highest technology in modular flooring for high traffic recreation rooms. 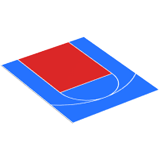 Combined strength and beauty make GYM FLEX tiles the ideal choice for any type of sport court or recreation area. Whether it’s the “party” room, billiard room, or in-house bar, GYM FLEX tiles will handle the dancing or the weight of your pool table, and allow for easy clean up after the party. GYM FLEX™ multi-purpose flooring is engineered with the everyday family in mind. It’s the perfect choice for retrofitting a basement floor into a vibrant scheme of colors. Add custom designs for games and other fun patterns. GYM FLEX™ has extremely Low Maintenance. Just clean with a broom or mop. The surface will withstand heavy-duty cleaning solutions or buffing machines for removing any black shoe marks. GYM FLEX™ will have the feel of hardwood, without the hardwood price. In fact, as a result of space age technology, it’s better than hardwood. Tougher, easy to repair, low cost, low maintenance, and cannot be damaged by water, or moisture, it becomes the economical choice for all your multi-purpose flooring needs. 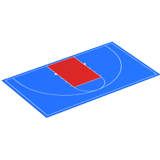 Flex Court offers a full line of court components both in standard and custom options. 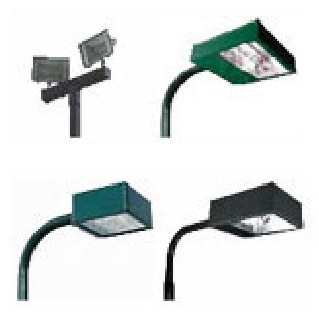 We offer a choice of components for every court environment — residential or commercial. 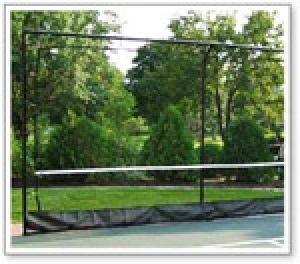 Includes two adjustable net collars for easy height adjustment from ground level to 8′ height, along with a Multi-Sports Net for your specific court size. A heavy duty #420 weather treated rebounder net, 1.9″ od ,16 gauge steel coated acrylic urethane finish frame, is available in standard 10′ x 10′ and 10′ x 20′, and also in custom sizes. Our fence frames are made from 1.9″ od ,16 gauge steel coated acrylic urethane finish, system includes all fittings with weather treated softFence netting, available from 5′ to 10′ height and custom lengths.